Drosophila larvae are able to associate odor stimuli with gustatory reward. Here we describe a simple behavioral paradigm that allows the analysis of appetitive associative olfactory learning. Apostolopoulou, A. A., Widmann, A., Rohwedder, A., Pfitzenmaier, J. E., Thum, A. S. Appetitive Associative Olfactory Learning in Drosophila Larvae. J. Vis. Exp. (72), e4334, doi:10.3791/4334 (2013). In the following we describe the methodological details of appetitive associative olfactory learning in Drosophila larvae. The setup, in combination with genetic interference, provides a handle to analyze the neuronal and molecular fundamentals of specifically associative learning in a simple larval brain. Organisms can use past experience to adjust present behavior. Such acquisition of behavioral potential can be defined as learning, and the physical bases of these potentials as memory traces1-4. Neuroscientists try to understand how these processes are organized in terms of molecular and neuronal changes in the brain by using a variety of methods in model organisms ranging from insects to vertebrates5,6. For such endeavors it is helpful to use model systems that are simple and experimentally accessible. The Drosophila larva has turned out to satisfy these demands based on the availability of robust behavioral assays, the existence of a variety of transgenic techniques and the elementary organization of the nervous system comprising only about 10,000 neurons (albeit with some concessions: cognitive limitations, few behavioral options, and richness of experience questionable)7-10. Drosophila larvae can form associations between odors and appetitive gustatory reinforcement like sugar11-14. In a standard assay, established in the lab of B. Gerber, animals receive a two-odor reciprocal training: A first group of larvae is exposed to an odor A together with a gustatory reinforcer (sugar reward) and is subsequently exposed to an odor B without reinforcement 9. Meanwhile a second group of larvae receives reciprocal training while experiencing odor A without reinforcement and subsequently being exposed to odor B with reinforcement (sugar reward). In the following both groups are tested for their preference between the two odors. Relatively higher preferences for the rewarded odor reflect associative learning - presented as a performance index (PI). The conclusion regarding the associative nature of the performance index is compelling, because apart from the contingency between odors and tastants, other parameters, such as odor and reward exposure, passage of time and handling do not differ between the two groups9. Drosophila wild-type larvae are raised at 25 °C and 60%-80% humidity in a 14/10 light/dark cycle. For controlling the exact age of the larvae always 20 females are put with 10 males into one vial (6 cm height and 2.5 cm diameter) that includes about 6 ml of standard fly food. Flies are allowed to lay eggs for 12 hr and are transferred to a new vial on the second day. 5-6 days after egg laying larvae reach the feeding 3rd instar stage if raised at 25 °C and can now be used for the behavioral experiment. However, one has to ensure to only take larvae that are still in the food and not the larvae from the side of the vial. These larvae have already reached "wandering 3rd instar stage" - shortly before pupation - and their usage complicates the interpretation of the results. Preparation of 2.5% agarose Petri dishes (other labs use also agar concentrations of 1% throughout the experiment, however lower concentrations may allow the feeding 3rd instar larvae to dig into the substrate): Dissolve 2.5 g agarose in 100 ml ddH2O. Heat up the solution in a microwave until it starts boiling. Carefully agitate the solution and put it back into the microwave until all agarose is dissolved. Pour the hot agarose solution into Petri dishes such that the bottom of the Petri dishes is completely covered and the agarose solution forms a smooth surface. Let the solution cool down to room temperature and close the lids. Do not immediately close the lids, because it would allow for condensation of water at the lids. Preparation of 2M fructose Petri dishes: Dissolve 2.5 g agarose in 100 ml ddH2O (again, usage of 1% agar concentration is possible; however it may allow feeding 3rd instar larvae to dig into the substrate). Heat up the solution in a microwave until it starts boiling. Carefully agitate the solution and put it back into the microwave until all agarose is dissolved. Carefully add 35 g of fructose into the hot solution; slowly agitate the mixture until the sugar is dissolved to avoid boiling retardation. Pour the hot fructose-agarose solution into Petri dishes such that the bottom is completely covered and the fructose-agarose solution forms a smooth surface. Let the solution cool down to room temperature and close the lids. Do not immediately close the lids, because it would allow for condensation of water at the lids. Preparation of 1-octanol (OCT) odor containers: Fill 10 μl of pure OCT into a custom made Teflon odor container and close it with a lid that has several small holes to allow for evaporation of the odor. A detailed description of the containers is given in Gerber and Stocker 2007. Prepare three odor containers for OCT. Odor containers allow for the evaporation of the inserted chemicals, but avoid that larvae can directly contact them. Thus, the here described experiments specifically address olfactory learning in larvae without perturbing gustatory side effects. Preparation of amylacetate (AM) odor containers: Dilute AM 1:50 in paraffin oil. Fill 10 μl of the dilution into a custom made Teflon odor container and close it with a lid that has several small holes to allow for evaporation of the odor. Prepare three odor containers for AM. The dilution is important for practical reasons, namely to avoid a strong preference for one odor over the other that may mask a learning-dependent change in the relative preference between the two odors. The equal attraction for both odors may need to be confirmed in the lab before the experiment by applying the later described test (2.5) with naïve animals. The values here presented are based on several publications of the Gerber lab that were recently reproduced by our lab9,15,16. Labeling of the Petri dishes: Before the behavioral experiments all Petri dishes have to be coded. That means that fructose containing Petri dishes have to be marked for example with an "X" or an "A" and agarose only Petri dishes with a "Y" or a "B". This code should be revealed to the experimenter only after all data have been recorded. By performing the experiments "blind" it is thus not possible that the expectations of the experimenter can affect the performance of the larvae. To ease an understanding for the broad readership in the following we will only talk about the odors as conditioned stimuli (CS1 or CS2) that are either rewarded when presented on a fructose Petri dish(+) or non-rewarded when presented on an agarose only Petri dish(-). Collect 30 feeding 3rd instar larvae from a food vial. Transfer them to a first Petri dish that contains some drops of tap water and carefully move them forwards and backwards with a brush. Transfer them to a second Petri dish that contains also some drops of tap water to check that no food paste remains on the bodywall of the larvae; otherwise larvae would be able to experience the food odor during the experiment. This would likely obscure the learning process and their performance in the test situation. Training: To train larvae to associate odors with an appetitive sugar cue the following regime is applied. Put an OCT odor container on the left and right side of an "X" marked - thus, fructose reward containing (+) Petri dish ("blind" experiment, for details see 1.6). Put the group of 30 feeding 3rd instar larvae onto the middle of the Petri dish, close the lid and wait for 5 min while the animals are exposed to OCT. Make sure that the larvae are not trapped inside the water drop and can overcome the surface tension of it. By that larvae can freely move on the Petri dish and experience olfactory and/or gustatory stimuli. Training: Remove the larvae from the Petri dish with a moistened brush and transfer them onto a second Petri dish that is labeled with a "Y" - thus, agarose only (-) containing Petri dish - and has an AM odor container located on its left and right side. Close the lid and wait for 5 min while the animals are exposed to AM. Training: Repeat 2.2) and 2.3) twice, such that all 30 larvae experience three training cycles: CS1 / (+) - CS2 / (-); CS1 / (+) - CS2 / (-); CS1 / (+) - CS2 / (-). In this experiment CS1 represents OCT and CS2 codes for AM. Test: Place one AM and one OCT odor container on the opposing sites of an agarose-only Petri dish. Transfer the trained animals to the middle of the test Petri dish. Close the lid and wait for 5 min. Subsequently count the number of larvae on the left side, the middle and right side of the test Petri dish. Repeat steps 2.1) to 2.5) with a second group of 30 feeding 3rd instar larvae but swap the experimental roles of AM and OCT such that the animals receive the following training: CS2 / (+) - CS1 / (-); CS2 / (+) - CS1 / (-); CS2 / (+) - CS1 / (-). In this experiment CS1 represents OCT and CS2 codes for AM. To prevent systematic effects of stimuli in the surrounding experimental environment, one should perform the test in one-half of the cases such that OCT is presented on the left and AM to the right. In the other half of the cases AM should be presented on the left and OCT on the right. The design of the above described experiments allows for analyzing odor-sugar learning in wild type feeding 3rd instar larvae on its own. However, in daily lab life researchers usually use two or more different experimental groups of larvae to compare, if olfactory learning depends on a particular gene, a specific set of neurons, a mutant stock, a special food diet, different rearing conditions, toxic chemicals added during development, etc. Thus, in all cases when two or more experimental groups of larvae are tested one has to do a set of mandatory control experiments to test, if the different groups of larvae show proper sensory-motor acuities. This becomes mandatory as potential phenotypes are not necessarily due to reduced or abolished abilities to associate odors with sugar. Rather, potential learning defects could be based on defects at any step of the sensory-motor circuitry in the processing of odors and/or sugar. Or in other words, if a mutant larva is not able to sense sugar, it cannot establish a sugar memory. But this does not allow concluding that the larva cannot learn. In detail the following control experiments have to be done to test for proper OCT, AM and fructose processing of transgenic larvae. Collect 30 feeding 3rd instar larvae from a food vial. Wash them carefully in tap water as described in 2.1. Put a single OCT odor container on one side of an agarose Petri dish, add the larvae onto the middle of the Petri dish, close the lid and wait for 5 min, such that the larvae can crawl on the Petri dish and orient towards the OCT odor source. Subsequently count the number of larvae on the left side, in the middle and on the right side of the test Petri dish. Collect 30 feeding 3rd instar larvae from a food vial. Wash them carefully in tap water as described in 2.1. Put a single AM odor container on one side of an agarose Petri dish, add the larvae onto the middle of the Petri dish, close the lid and wait for 5 min, such that the larvae can crawl on the Petri dish and orient towards the AM odor source. Subsequently count the number of larvae on the left side, in the middle and on the right side of the test Petri dish. Collect 30 feeding 3rd instar larvae from a food vial. Wash them carefully in tap water as described in 2.1. Prepare Petri dishes that contain 2.5% agarose in one half and a 2M fructose-agarose mixture in the other half. Add the larvae onto the Petri dish, close the lid and wait for 5 min, such that the larvae can crawl on the Petri dish and orient towards the fructose containing side. Subsequently count the number of larvae on the left side, in the middle and on the right side of the test Petri dish. Preparation of half-half Petri dishes: Prepare normal agarose plates as described above in section 1.2. When the agarose filled Petri dishes are cooled down, carefully cut the agarose along the vertical axis with a scalpel. Remove one half of the agarose from the Petri dish. Add a hot fructose-agarose solution (for preparation see 1.3) to the empty half of the Petri dish. Be careful that both halves match and do not form a defined edge - this affects the larval choice behavior and renders a behavioral analysis rather difficult.4. Despite testing if transgenic feeding 3rd instar larvae are able to distinguish on a wild type level between OCT and air (3.1), AM and air (3.2) and sugar and pure agarose (3.3), an additional set of test experiments has recently been introduced (for discussion see Gerber and Stocker, 2007). The rationale for these experiments is the following. During the training larvae undergo massive handling and successive odor and sugar stimulation. 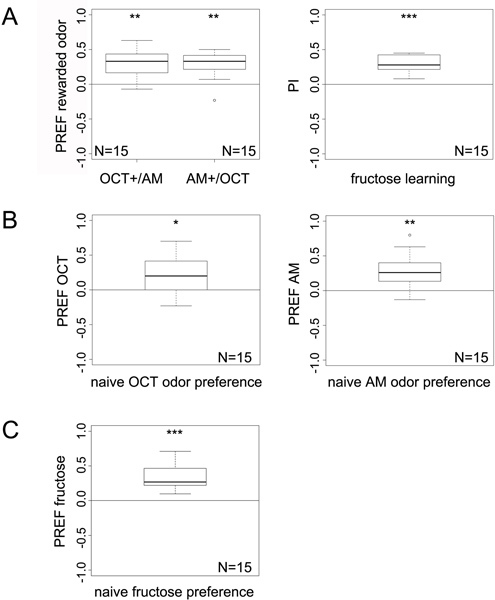 Thus, it is well possible that the observed learning phenotype is misleading (although naïve odor and sugar perception tests are on a wild type level!). Indeed, it is possible that the transgenic animals differ from wild type larvae with respect to stress resistance, motivation, fatigue, sensory adaptation, contextual learning, and changes in satiety. Thus, Michels et al. (2005) introduced controls that test whether a given mutant is able to (1) detect AM versus an empty odor container if you treat the larvae exactly as during training except that you omit the reward and merely expose to both odors; (2) detect OCT after the same regime; (3) detect AM versus an empty odor container, if you treat the larvae in a training-like way except that you omit the odors and merely expose to the reward; and (4) detect OCT after the same regimen. For a comprehensive discussion and further details on the methods please see Michels et al (2005) and Gerber and Stocker (2007). Thus PIs can range from -1 to 1. Significantly negative values represent aversive learning, whereas significantly positive values describe appetitive learning. A complete experiment usually comprises of 10 or more PIs. Data are visualized as box plots including all values of a given experimental group. 50% of the values being located within the box; the median performance index is indicated as a bold line within the box plot. Details for the sham training are given in Michels et al. 2005. 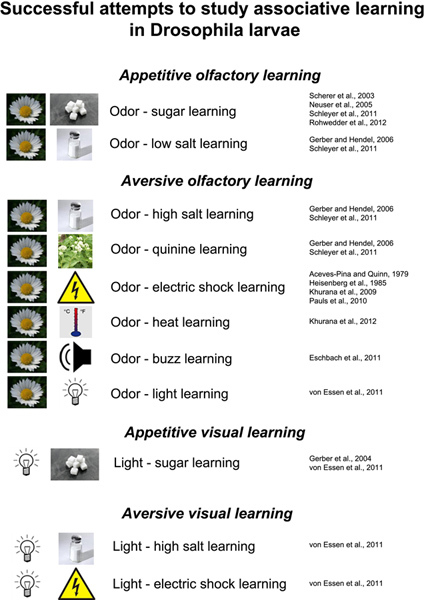 Figure 1A shows an overview of the experimental procedures for larval olfactory associative learning. By pairing one of the two presented odors with a sugar reward larvae acquire the behavior potential to express an attractive response towards the rewarded odor in comparison to the unrewarded odor. Two groups of larvae are always trained by either pairing the reinforcer with the odor OCT or AM. The performance index (PI) measures the associative function as the difference in preference between the reciprocally trained groups. In case associative function is analyzed in transgenic larvae, tests for basic sensory-motor ability are required. This is done by offering them the choice between a filled odor container and air or between pure agarose and agarose plus a sugar. (Sham training is not shown here). The final distribution of the larvae is noted in a specific data sheet (Figure 2) and visualized as a box plot (Figure 3). Positive results indicate an attractive choice behavior for the preference indices and appetitive learning in case of the performance indices. Negative values indicate an aversive choice behavior for the calculated preference indices and aversive learning in case of the performance indices. Figure 1. Scheme of the behavioral experiments to measure larval associative olfactory learning, naïve olfactory preferences and naïve gustatory preferences. 30 Drosophila feeding 3rd instar larvae are placed for five minutes on an agarose Petri dish that contains a sugar reward of 2M fructose. At the same time a first odor is provided in Teflon containers (OCT). Thus larvae can associate an odor stimulus with a positive reinforcer in the first training phase. Next, larvae are transferred to a second agarose Petri dish without reinforcer but with the second odor (AM) for again 5 min. The training is repeated three times. Finally, in the test situation the odor preference of the larvae is measured for the rewarded odor against the non-rewarded odor on an agarose Petri dish. This allows the calculation of a first preference index (PREF). A second group of larvae is trained similarly in a reciprocally way. Here, a second preference index (PREF) can be calculated. Finally a Performance Index (PI) is calculated by averaging both preference indices. For further information regarding the sequence of the trials see also 2.7. For analyzing the naïve odor preference, a single odor container filled with either OCT or AM is placed on one side of a pure agarose Petri dish. 30 feeding 3rd instar larvae are placed in the middle of the Petri dish and after 5 min the distribution of the larvae on the Petri dish is counted. From the obtained data an olfactory preference index (PREF) is then calculated. For analyzing the naïve gustatory preference 2M fructose is filled in one half of a Petri dish that contains pure agarose on its other side. 30 feeding 3rd instar larvae are placed in the middle of the Petri dish and after 5 min the distribution of the larvae on the Petri dish is counted. From the obtained data a gustatory Preference Index (PREF) is then calculated. Figure 2. 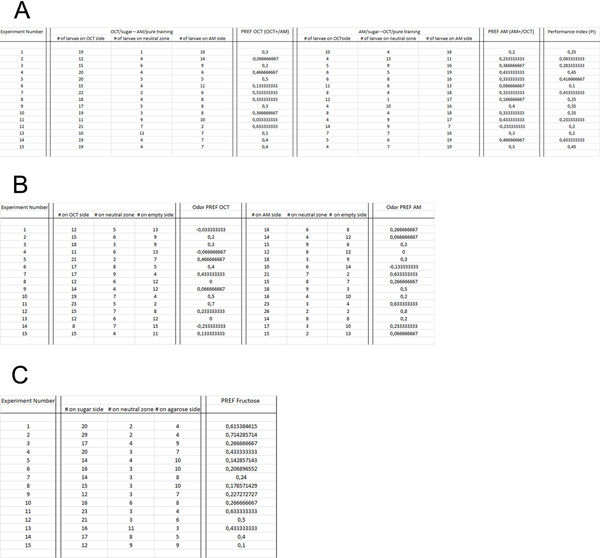 Example of a raw data sheet for registering and processing data obtained for A) sugar reward learning, B) naïve odor preferences and C) naïve gustatory preferences. For all experiments the number of larvae on the left side, in the middle and on the right side of the Petri dishes are noted. Out of this information preference indices (PREF) are calculated. Larval learning is depicted as performance indices (PI) deriving from computating the PREFs of two reciprocally trained groups. Click here to view larger figure. Figure 3. Example data visualization obtained for A) sugar reward learning, B) naïve odor preferences and C) naïve gustatory preferences. Boxplots represent data as follows: median (bold line within box); the box indicates 50% of all data points whereas the upper and lower whisker represents the other 25% each. Therefore without outliers the minimum and maximum values are indicated by the whisker boundaries. Outliers are depicted as small circles they are defined as any point more than 1.5 times the interquartile range from the 1st and 3rd quartiles. 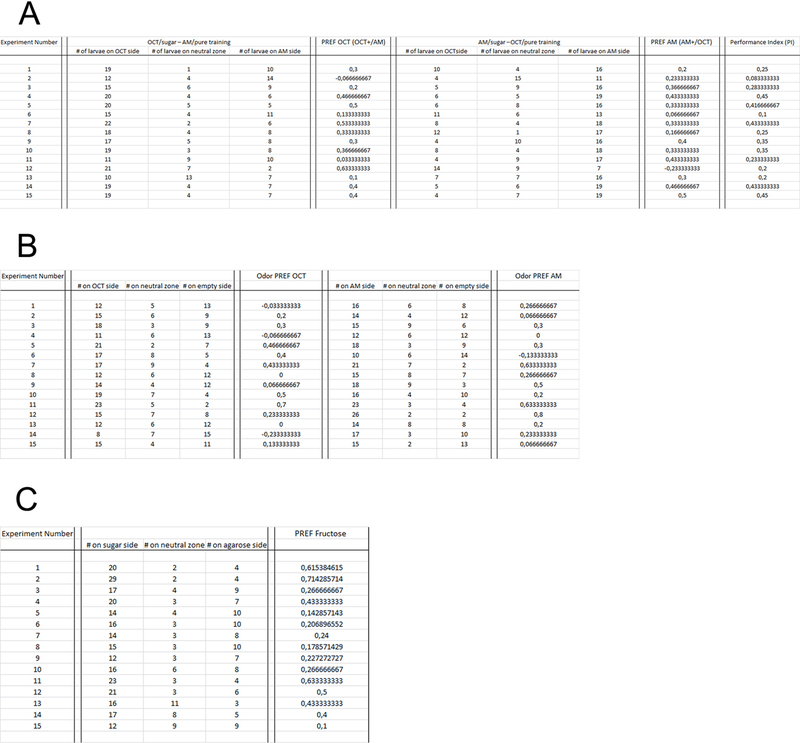 Statistical analysis of single data points is done with Wilcoxon signed-rank test, whereas Wilcoxon rank sum test is used for comparison of two data groups. Significance levels are indicated as n.s. for p>0.05, * for p<0.05, ** for p<0.01 or *** for p<0.001. Sample size of each experiment: N=15. For the learning experiments in A) always two preference indices (PREF) of reciprocal experiments are taken to calculate the final performance index (PI). Performance Indices (PI) are depicted as box plots accordingly. Figure 4. Examples of GAL4 lines each of which labels a specific set of cells within the larval brain. Always full z-projections of frontal views of the larval brain are shown. Specific sets of neurons are labelled by anti-green fluorescent protein (green) in the whole larval CNS that is visualized by anti-FasII/anti-ChAT doublestaining (magenta). A) NP225 labels a set of second order olfactory neurons, called projection neurons (arrow) and the developing adult visual system (arrowhead). B) NP2426 marks a set of olfactory interneurons (arrow) at the first olfactory relay station, called the antennal lobe. C) GR66a labels exclusively a set of gustatory sensory neurons that project from peripheral gustatory sensory organs to the subeosophageal ganglion (arrow). D) NP3128 labels several sets of different types of neurons. The arrow marks olfactory interneurons of the antennal lobe similar to B. The arrowhead highlights a set of dopaminergic neurons that project onto a neuropil region called mushroom body. E) H24 marks a set of mushroom body Kenyon cells (arrow), neurons that where shown to be necessary for larval olfactory learning. 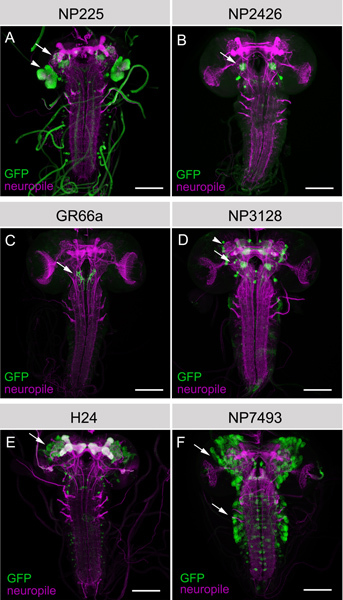 F) NP7493 is an example of a relatively unspecific expression pattern that includes several sets of developing neurons (arrows) that will further differentiate during metamorphosis to form the brain of the fly. Scale bars = 50 μm. Figure 5. Overview summarizing successful attempts to study associative learning in Drosophila larvae. Olfactory stimuli as well as light can be used as a conditioned stimulus to be associated with either reward or punishment (unconditioned stimulus). Rewarding stimuli include sugar and low concentrations of salt; punishing stimuli comprise high concentrations of salt, quinine, electric shock, heat, mechanical stimulation through vibration (buzz) and light11,12,17-24. Click here to view larger figure. Table 1. UAS effector constructs often used in the lab to visualize the neuronal anatomy and manipulate synaptic transmission25-33. The described setup in Drosophila larvae allows for the investigation of associative olfactory learning within a comparably elementary brain. The approach is simple, cheap, easy to establish in a lab and does not require high-tech equipment9. We present a version of the experiment, to study appetitive associative learning reinforced by fructose reward11. The described setup is based on a series of parametrical studies that comprehensively investigated variations in the number of training trials, single assay versus mass assay, retention time, used odors and odor concentrations and gender9,15,34,35. Thus, the depicted behavioral setup integrates this information in an exceptionally reproducible approach to study higher brain functions in Drosophila. Ultimately, based on its simple setup the rewarding or punishing effect of any dissoluble substance can be easily tested with this assay. In addition, several variants of the paradigm were recently published that allow the investigation of associative visual learning in the larvae23,36 (established in Gerber et al. (2004)); and electric shock, light, heat, quinine or vibrations were also successfully implemented as aversive reinforcers for associative olfactory learning9,17,19-21,37-40. Thus, a comprehensive set of experimental setups exists to analyze the behavioral, neuronal and molecular basis of learning and memory in Drosophila larvae (Figure 5)13,14,41,42. Here, we focused exclusively on odor-fructose learning due to the robustness of the assay and the relatively high performance indices that can be achieved. Especially some of the aversive variants lead to only small behavioral changes. This limits to some extent the application of the method, besides developmental issues of the animals that make studies on larval long-term memory rather impossible. The larval brain consists of only about 10,000 neurons in its entirety. Thus due to its relative simple (in terms of numbers) organization it is well accessible to genetic interference, which in turn allows for advanced studies on the molecular and neuronal basis of learning and memory. Especially the GAL4/UAS systems and its recent modifications allow for the genetic manipulation of defined sets of neurons and up to even single cells in a spatio-temporal manner (Figure 4)7,10. Hereby a comprehensive set of effector lines offers the possibility to visualize these defined sets of neurons (Figure 4)25,43 or, alternatively to manipulate their neuronal output (Table 1). Most often effector genes are applied that can cell-autonomously induce cell death or inhibit neuronal transmission29,30,33. More recently technologies were developed that allow for a controlled artificial activation of neurons driven by light or temperature (Table 1)31,32,44. In summary, the combination of sophisticated ways of genetic interference and the here described behavioral experiments allow uncovering the neuronal, molecular and behavioral basis of learning and memory in the elementary brain of Drosophila larvae. We especially want to thank the members of the Gerber lab for technical instructions on their experimental setup and comments on the manuscript. We also thank Lyubov Pankevych for fly care and maintenance of the wild type CantonS stock. This work is supported by the DFG grant TH1584/1-1, the SNF grant 31003A_132812/1 and the Zukunftskolleg of the University of Konstanz (all to AST). Pawlow, I. P. New Researches on Conditioned Reflexes. Science. 58, 359-361 (1923). Heisenberg, M. Mushroom body memoir: from maps to models. Nat. Rev. Neurosci. 4, 266-275 (2003). Kandel, E. R. Cellular insights into behavior and learning. Harvey Lect. 73, 19-92 (1979). Gerber, B., Tanimoto, H., Heisenberg, M. An engram found? Evaluating the evidence from fruit flies. Curr. Opin. Neurobiol. 14, 737-744 (2004). Milner, B., Squire, L. R., Kandel, E. R. Cognitive neuroscience and the study of memory. Neuron. 20, 445-468 (1998). Keene, A. C., Waddell, S. Drosophila olfactory memory: single genes to complex neural circuits. Nat. Rev. Neurosci. 8, (2007). Gerber, B., Stocker, R. F., Tanimura, T., Thum, A. S. Smelling, tasting, learning: Drosophila as a study case. Results Probl. Cell. Differ. 47, 139-185 (2009). Gerber, B., Stocker, R. F. The Drosophila larva as a model for studying chemosensation and chemosensory learning: a review. Chem. Senses. 32, 65-89 (2007). Gerber, B., Hendel, T. Outcome expectations drive learned behaviour in larval Drosophila. Proc. Biol. Sci. 273, 2965-2968 (2006). Pauls, D., Selcho, M., Gendre, N., Stocker, R. F., Thum, A. S. Drosophila larvae establish appetitive olfactory memories via mushroom body neurons of embryonic origin. J. Neurosci. 30, 10655-10666 (2010). Selcho, M., Pauls, D., Han, K. A., Stocker, R. F., Thum, A. S. The role of dopamine in Drosophila larval classical olfactory conditioning. PLoS One. 4, e5897 (2009). Neuser, K., Husse, J., Stock, P., Gerber, B. Appetitive olfactory learning in Drosophila larvae:effects of repetition, reward strength, age, gender, assay type and memory span. Animal Behaviour. 69, 891-898 (2005). Scherer, S., Stocker, R. F., Gerber, B. Olfactory learning in individually assayed Drosophila larvae. Learn Mem. 10, 217-225 (2003). Aceves-Pina, E. O., Quinn, W. G. Learning in normal and mutant Drosophila larvae. Science. 206, 93-96 (1979). Heisenberg, M., Borst, A., Wagner, S., Byers, D. Drosophila mushroom body mutants are deficient in olfactory learning. J. Neurogenet. 2, 1-30 (1985). Khurana, S., Abu Baker, M. B., Siddiqi, O. Odour avoidance learning in the larva of Drosophila melanogaster. J. Biosci. 34, 621-631 (2009). Pauls, D., et al. Electric shock-induced associative olfactory learning in Drosophila larvae. Chem. Senses. 35, 335-346 (2010). Eschbach, C., et al. Associative learning between odorants and mechanosensory punishment in larval Drosophila. J. Exp. Biol. 214, 3897-3905 (2011). von Essen, A. M., Pauls, D., Thum, A. S., Sprecher, S. G. Capacity of visual classical conditioning in Drosophila larvae. Behav. Neurosci. 125, 921-929 (2011). Gerber, B., et al. Visual learning in individually assayed Drosophila larvae. J. Exp. Biol. 207, 179-188 (2004). Rohwedder, A., et al. Nutritional Value-Dependent and Nutritional Value-Independent Effects on Drosophila melanogaster Larval Behavior. Chem. Senses. (2012). Lee, T., Lee, A., Luo, L. Development of the Drosophila mushroom bodies: sequential generation of three distinct types of neurons from a neuroblast. Development. 126, 4065-4076 (1999). Ito, K., et al. The organization of extrinsic neurons and their implications in the functional roles of the mushroom bodies in Drosophila melanogaster Meigen. Learn Mem. 5, 52-77 (1998). Wang, J., et al. Transmembrane/juxtamembrane domain-dependent Dscam distribution and function during mushroom body neuronal morphogenesis. Neuron. 43, 663-672 (2004). Robertson, K., Mergliano, J., Minden, J. S. Dissecting Drosophila embryonic brain development using photoactivated gene expression. Dev. Biol. 260, 124-137 (2003). Zhou, L., et al. Cooperative functions of the reaper and head involution defective genes in the programmed cell death of Drosophila central nervous system midline cells. Proc. Natl. Acad. Sci. U.S.A. 94, 5131-5136 (1997). Kitamoto, T. Conditional modification of behavior in Drosophila by targeted expression of a temperature-sensitive shibire allele in defined neurons. J. Neurobiol. 47, 81-92 (2001). Schroll, C., et al. Light-induced activation of distinct modulatory neurons triggers appetitive or aversive learning in Drosophila larvae. Curr. Biol. 16, 1741-1747 (2006). Rosenzweig, M., et al. The Drosophila ortholog of vertebrate TRPA1 regulates thermotaxis. Genes Dev. 19, 419-424 (2005). Baines, R. A., Uhler, J. P., Thompson, A., Sweeney, S. T., Bate, M. Altered electrical properties in Drosophila neurons developing without synaptic transmission. J. Neurosci. 21, 1523-1531 (2001). Chen, Y. C., Mishra, D., Schmitt, L., Schmuker, M., Gerber, B. A behavioral odor similarity "space" in larval Drosophila. Chem. Senses. 36, 237-249 (2011). Saumweber, T., Husse, J., Gerber, B. Innate attractiveness and associative learnability of odors can be dissociated in larval Drosophila. Chem. Senses. 36, 223-235 (2011). von Essen, A. M., Pauls, D., Thum, A. S., Sprecher, S. G. Capacity of visual classical conditioning in Drosophila larvae. Behav. Neurosci. (2011). Honjo, K., Furukubo-Tokunaga, K. Induction of cAMP response element-binding protein-dependent medium-term memory by appetitive gustatory reinforcement in Drosophila larvae. J. Neurosci. 25, 7905-7913 (2005). Honjo, K., Furukubo-Tokunaga, K. Distinctive neuronal networks and biochemical pathways for appetitive and aversive memory in Drosophila larvae. J. Neurosci. 29, 852-862 (2009). Khurana, S., et al. Olfactory Conditioning in the Third Instar Larvae of Drosophila melanogaster Using Heat Shock Reinforcement. Behav. Genet. 42, 151-161 (2012). Tully, T., Cambiazo, V., Kruse, L. Memory through metamorphosis in normal and mutant. 14, 68-74 (1994). Michels, B., et al. Cellular site and molecular mode of synapsin action in associative learning. Learn Mem. 18, 332-344 (2011). Saumweber, T., et al. Behavioral and synaptic plasticity are impaired upon lack of the synaptic protein SAP47. J. Neurosci. 31, 3508-3518 (2011). Pfeiffer, B. D., et al. Refinement of tools for targeted gene expression in Drosophila. Genetics. 186, 735-755 (2010). Rosenzweig, M., Kang, K., Garrity, P. A. Distinct TRP channels are required for warm and cool avoidance in Drosophila melanogaster. Proc. Natl. Acad. Sci. U.S.A. 105, 14668-14673 (2008).